Congratulations to winners Jackie Villano and Leanne Cobbledick! In my house growing up, it was all about the margarine. Sure, maybe you would use real butter when baking cookies, but for everyday use, for the buttering of bread and potatoes and sundry vegetables, it was all about the margarine. Some Country Crock, some Blue Bonnet, some Gold N Soft. I don't know about you, but growing up on margarine makes just regular butter seem kind of bland when just spread on things. Not to mention how difficult spreading regular ole butter is. But there's been this whole movement against margarine. You know, it's bad for you. And truly, it is. Partially hydrogenated oils and whatnot are obviously not something good for the body. There are many alternatives out there nowadays to get your margarine fix without the actual margarine. Melt Organic contacted me about trying out their new butter spread, and I thought why the heck not? Instead of partially hydrogenated whatever, they use a combination of virgin coconut oil, palm fruit oil, canola oil, sunflower oil, and flaxseed oil to give you the nice buttery flavor your young self became accustomed to, without all the nastiness. So what's my opinion on the product, you may wonder? I actually really like it. It looks more like regular butter than your average margarine, melts very much like regular butter as well, and is easily spreadable. All important factors. And what about the taste? It's a bit less "buttery" than your average margarine spread, or I guess I should say it's a bit less "margarine-y" as it tastes more like regular butter. I was concerned there may be a slight coconut flavor since I am not a huge coconut fan, but while there is a twinge of sweetness, it's not necessarily coconut flavored. Since I had two coupons, I decided to also give the honey version a try. Honestly I was not as big of a fan of this one. It's kind of a honey/cinnamon blend, so if you really like to have cinnamon sugar toast, you'll probably enjoy it more than me, but I found myself hardly ever wanting to use it. That's really probably just a personal preference thing and nothing against the product itself, I just found it maybe to be a touch too sweet. 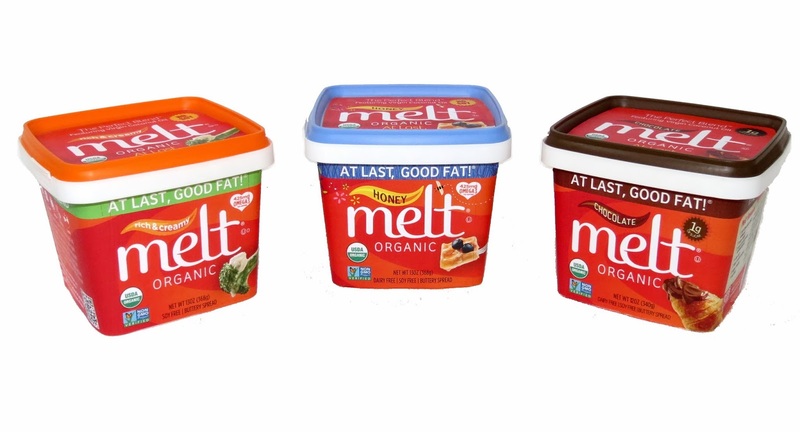 There has been some brouhaha about the fact that Melt touts itself as being an alternative to butter when it actually contains organic ghee (clarified butter) in the ingredients, which makes it a milk product after all. So, if you're looking for something that does not have butter/milk in it, this won't be for you. But if you're looking for something as a healthier alternative, then perhaps Melt is the way to go. I will note that it is gluten free, for those that are not gluten friendly. Now the fun part - YOU can get in on the action and try out Melt too! Win a prize pack of one cutting board, one spreader, and coupons for free Melt Organic spread. The giveaway will end on February 28th at which time Melt will randomly select one winner per participating blog. I will then notify the winner here so they can claim their prize. Disclaimer: I received vouchers for Melt Organic buttery spread, so it was free. I also received a complimentary cutting mat and spreader as shown in the above photo. I was not otherwise compensated for this review, and all opinions are my own. Yeah I'm not sure what the chocolate one is like! They didn't have that one in stores yet when I tried it out. The honey would be good on cornbread too. I just found I didn't use it very often, whereas I did use up all of the regular.